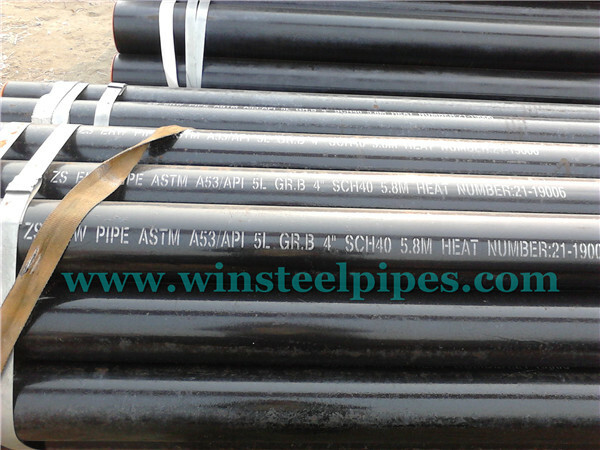 This standard is issued under the fixed designation ASTM A53 pipe specification /A 53M; the number immediately following the designation indicates the year of original adoption or, in the case of revision, the year of last revision. A number in parentheses indicates the year of last re-approval. A superscript epsilon (e) indicates an editorial change since the last revision or re-approval. 1.1 ASTM A53 pipe specification 2 covers seamless and welded black and hot-dipped galvanized steel pipe in NPS 1⁄8 to NPS 26 [DN 6 to DN 650] (Note 1), inclusive, with nominal wall thickness (Note 2) as given in Table X2.2 and Table X2.3. It shall be permissible to furnish pipe having other dimensions (Note 2) provided such pipe complies with all other requirements of this specification. NOTE 2—The term nominal wall thickness has been assigned for the purpose of convenient designation, existing in name only, and is used to distinguish it from the actual wall thickness, which may vary over or under the nominal wall thickness. 1.2.3 Type S—Seamless, Grades A and B. NOTE 3—See Appendix X 1 for definitions of types of pipe. 1.3.1 Type F is not intended for flanging. 1.3.2 When Types S and E are required for close coiling or cold bending, Grade A is the preferred grade. This provision is not intended to prohibit the cold bending of Grade B pipe. 1.3.3 Type E is furnished either non-expanded or cold expanded at the option of the manufacturer. 1.5 The following precautionary caveat pertains only to the test method portion, Sections 9, 10, 11, 15, 16, and 17 of this specification: This standard does not purport to address all of the safety concerns, if any, associated with its use. It is the responsibility of the user of this standard to establish appropriate safety and health practices and determine the applicability of regulatory limitations prior to use. 1.6 The text of this specification contains notes or footnotes, or both, that provide explanatory material. Such notes and footnotes, excluding those in tables and figures, do not contain any mandatory requirements. 3.1.14 Selection of applicable level of preservation and packaging and level of packing required, if other than as specified or if MIL-STD-163 applies (see 21.2). 4.1 The steel for both seamless and welded pipe shall be made by one or more of the following processes: open-hearth, electric-furnace, or basic-oxygen. 4.2 When steels of different grades are sequentially strand cast, identification of the resultant transition material is required. The producer shall remove the transition material by any established procedure that positively separates the grades. 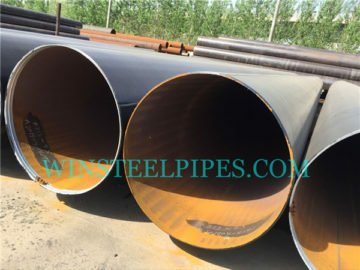 4.3 The weld seam of electric-resistance welded pipe in Grade B shall be heat treated after welding to a minimum of 1000°F [540°C] so that no untempered martensite remains, or otherwise processed in such a manner that no untempered martensite remains. shall not exceed 11⁄2 % of the outside diameter pipe size. 5.1 The steel shall conform to the requirements as to chemical composition in Table 1 and the chemical analysis shall be in accordance with Test Methods, Practices, and Terminology A 751. 6.1 The purchaser is permitted to perform an analysis of two pipes from each lot of 500 lengths, or fraction thereof. Samples for chemical analysis, except for spectrographic analysis, shall be taken in accordance with Practice E 1806. The chemical composition thus determined shall conform to the requirements specified in Table 1. 6.2 If the analysis of either pipe does not conform to the requirements specified in Table 1, analyses shall be made on additional pipes of double the original number from the same lot, each of which shall conform to the requirements specified. 7.1 The material shall conform to the requirements as to tensile properties prescribed in Table 2. 7.2 The yield strength corresponding to a permanent offset of 0.2 % of the gage length of the specimen or to a total extension of 0.5 % of the gage length under load shall be determined. 7.3 The test specimen taken across the weld shall show a tensile strength not less than the minimum tensile strength specified for the grade of pipe ordered. This test will not be required for pipe under NPS 8 [DN 200]. 7.4 Transverse tension test specimens for electric-welded pipe NPS 8 [DN 200] and larger shall be taken opposite the weld. All transverse test specimens shall be approximately 11⁄2 in. [40 mm] wide in the gage length, and shall represent the full wall thickness of the pipe from which the specimen was cut. This test is required for NPS 8 [DN 200] and larger. 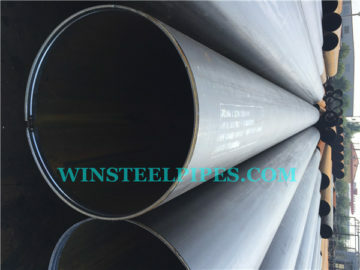 8.1 For pipe NPS 2 [DN 50] and under, a sufficient length of pipe shall be capable of being bent cold through 90° around a cylindrical mandrel, the diameter of which is twelve times the outside diameter of the pipe, without developing cracks at any portion and without opening the weld. 8.2 When ordered for close coiling, the pipe shall stand being bent cold through 180° around a cylindrical mandrel, the diameter of which is eight times the outside diameter of the pipe, without failure. 8.3 Double-extra-strong pipe over NPS 11⁄4 [DN 32] need not be subjected to the bend test. 9.1 The flattening test shall be made on pipe over NPS 2 [DN 50] with all thicknesses extra strong and lighter. 9.2.1 For seamless pipe, a test specimen at least 2 1⁄2 in. [60 mm] in length shall be flattened cold between parallel plates in two steps. During the first step, which is a test for ductility, no cracks or breaks on the inside, outside, or end surfaces, except as provided for in 9.7, shall occur until the distance between the plates is less than the value of H calculated as follows: H 5 ~1 1e!t/~e 1 t/D! 9.2.2 During the second step, which is a test for soundness, the flattening shall be continued until the test specimen breaks or the opposite sides of the pipe meet. Evidence of laminated or unsound material that is revealed during the entire flattening test shall be cause for rejection. NOTE 4—The H values have been calculated for standard and extra heavy weight sizes from NPS 21⁄2 to NPS 24 [DN 65 to DN 600], inclusive, and are shown in Table X2.1. 9.3 Electric-Resistance-Welded Pipe— A test specimen at least 4 in. [100 mm] in length shall be flattened cold between parallel plates in three steps, with the weld located either 0° or 90° from the line of direction of force as required in 9.3.1 or 9.3.2, whichever is applicable. During the first step, which is a test for ductility of the weld, no cracks or breaks on the inside or outside surfaces at the weld shall occur until the distance between the plates is less than two thirds of the specified diameter of the pipe. As a second step, the flattening shall be continued as a test for ductility away from the weld. During the second step, no cracks or breaks on the inside or outside surfaces away from the weld, except as provided for in 9.7, shall occur until the distance between the plates is less than one third of the specified outside diameter of the pipe but is not less than five times the wall thickness of the pipe. During the third step, which is a test for soundness, the flattening shall be continued until the test specimen breaks or the opposite walls of the pipe meet. Evidence of laminated or unsound material or of incomplete weld that is revealed by the flattening test shall be cause for rejection. 9.3.1 For pipe produced in single lengths, the flattening test specified in 9.3 shall be made using a test specimen taken from each end of each length of pipe. The tests from each end shall be made alternately with the weld at 0° and at 90° from the line of direction of force. 9.3.2.1 Test specimens taken from, and representative of, the front end of the first pipe intended to be supplied from each coil, the back end of the last pipe intended to be supplied from each coil, and each side of any intermediate weld stop location shall be flattened with the weld located at 90° from the line of direction of force. 9.3.2.2 Test specimens taken from pipe at any two locations, intermediate to the front end of the first pipe and the back end of the last pipe intended to be supplied from each coil shall be flattened with the weld located at 0° from the line of direction of force. 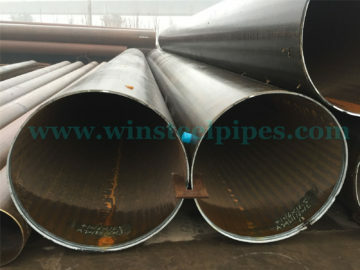 9.3.3 For pipe that is to be subsequently reheated throughout its cross section and hot formed by a reducing process, the manufacturer shall have the option of obtaining the flattening test specimens required by 9.3.1 or 9.3.2, whichever is applicable, either prior to or after such hot reducing. 9.4 Continuous-Welded Pipe—A test specimen at least 4 in. [100 mm] in length shall be flattened cold between parallel plates in three steps. The weld shall be located at 90° from the line of direction of force. During the first step, which is a test for ductility of the weld, no cracks or breaks on the inside, outside, or end surfaces at the weld shall occur until the distance between the plates is less than three fourths of the specified diameter of the pipe. As a second step, the flattening shall be continued as a test for ductility away from the weld. 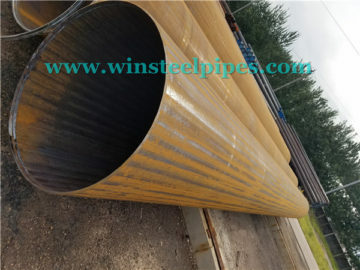 During the second step, no cracks or breaks on the inside, outside, or end surfaces away from the weld, except as provided for in 9.7, shall occur until the distance between the plates is less than 60 % of the specified outside diameter of the pipe. During the third step, which is a test for soundness, the flattening shall be continued until the test specimen breaks or the opposite walls of the pipe meet. Evidence of laminated or unsound material or of incomplete weld that is revealed by the flattening test shall be cause for rejection. 9.5 Surface imperfections in the test specimen before flattening, but revealed during the first step of the flattening test, shall be judged in accordance with the finish requirements in Section 14. 9.6 Superficial ruptures as a result of surface imperfections shall not be cause for rejection. 9.7 When low D-to-t ratio tubulars are tested, because the strain imposed due to geometry is unreasonably high on the inside surface at the 6 and 12 o’clock locations, cracks at these locations shall not be cause for rejection if the D-to-t ratio is less than 10. 10.1 The hydrostatic test shall be applied, without leakage through the pipe wall, to each length of pipe except as provided in 11.2 for seamless pipe. 10.2 Each length of plain-end pipe shall be hydrostatically tested to the pressures prescribed in Table X2.2, and each threaded-and-coupled length shall be hydrostatically tested to the pressures prescribed in Table X2.3. 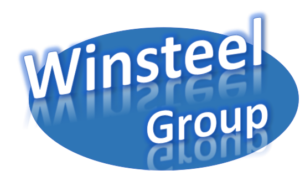 It shall be permissible, at the discretion of the manufacturer, to perform the hydrostatic test on pipe with plain ends, with threads only, or with threads and couplings and also shall be permissible to test pipe in either single lengths or multiple lengths. NOTE 5—The hydrostatic test pressures given herein are inspection test pressures, are not intended as a basis for design, and do not have any direct relationship to working pressures. 10.3 The minimum hydrostatic test pressure required to satisfy these requirements need not exceed 2500 psi [17 200 kPa] for NPS 3 [DN 80] and under, nor 2800 psi [19 300 kPa] for all sized over NPS 3 [DN 80]. This does not prohibit testing at a higher pressure at the manufacturer’s option. The hydrostatic pressure shall be maintained for not less than 5 s for all sizes of seamless and electric-welded pipe. 11.1.3 at least once every working turn or not more than 8 h to demonstrate its effectiveness and the inspection procedures. The equipment shall be adjusted to produce well-defined indications when the reference standard is scanned by the inspection unit in a manner simulating the inspection of the product. 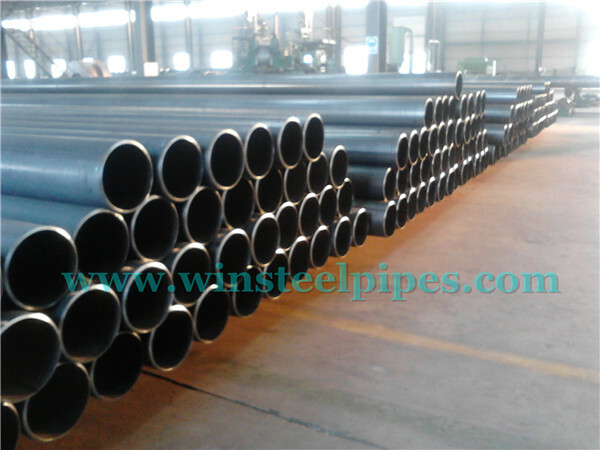 11.1.3 Reference Standards—The length of the reference standards shall be determined by the pipe manufacturer, and they shall have the same specified diameter and thickness as the product being inspected. Reference standards shall contain machined notches, one on the inside surface and one on the outside surface, or a drilled hole, as shown in Fig. 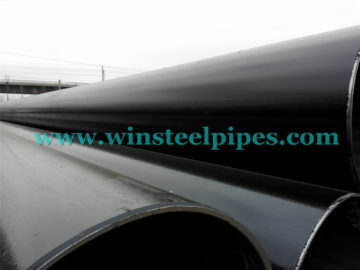 1, at the option of the pipe manufacturer. The notches shall be parallel to the weld seam, and shall be separated by a distance sufficient to produce two separate and distinguishable signals. The 1⁄8-in. [3.2-mm] hole shall be drilled through the wall and perpendicular to the surface of the reference standard as shown in Fig. 1. Care shall be taken in the preparation of the reference standard to ensure freedom from fins or other edge roughness, or distortion of the pipe. 11.1.4 Acceptance Limits—Table 3 gives the height of acceptance limit signals in percent of the height of signals produced by reference standards. Imperfections in the weld seam that produce a signal greater than the acceptance limit signal given in Table 3 shall be considered a defect unless the pipe manufacturer can demonstrate that the imperfection does not reduce the effective wall thickness beyond 121⁄2 % of the specified wall thickness. 11.2 Seamless Pipe—As an alternative to the hydrostatic test at the option of the manufacturer or where specified in the purchase order, the full body of each seamless pipe shall be tested with a nondestructive electric test in accordance with Practices E 213, E 309, or E 570. In such cases, each length so furnished shall include the mandatory marking of the letters “NDE.” Except as provided in 11.2.6.2, it is the intent of this nondestructive electric test to reject pipe with imperfections that produce test signals equal to or greater than that produced by the applicable calibration standard. 11.2.1 When the nondestructive electric test is performed, the lengths shall be marked with the letters “NDE.” The certification, when required, shall state Nondestructive Electric Tested and shall indicate which of the tests was applied. Also, the letters NDE shall be appended to the product specification number and material grade shown on the certification. 11.2.2 The following information is intended to facilitate the use of this specification. 11.2.5 are convenient standards for calibration of nondestructive testing equipment. The dimensions of such standards are not to be construed as the minimum sizes of imperfections detectable by such equipment. 11.2.2.2 The ultrasonic testing referred to in this specification is capable of detecting the presence and location of significant longitudinally or circumferentially oriented imperfections; however, different techniques need to be employed for the detection of differently oriented imperfections. Ultrasonic testing is not necessarily capable of detecting short, deep imperfections. 11.2.2.3 The eddy current examination referenced in this specification has the capability of detecting significant discontinuities, especially of the short abrupt type. 11.2.2.4 The flux leakage examination referred to in this specification is capable of detecting the presence and location of significant longitudinally or transversely oriented discontinuities. The provisions of this specification only require longitudinal calibration for flux leakage. Different techniques need to be employed for the detection of differently oriented imperfections. 11.2.2.5 The hydrostatic test referred to in 10.2 has the capability of finding imperfections of a size permitting the test fluid to leak through the tube wall and may be either visually seen or detected by a loss of pressure. Hydrostatic testing is not necessarily capable of detecting very tight through-the-wall imperfections or imperfections that extend an appreciable distance into the wall without complete penetration. 11.2.2.6 A purchaser interested in ascertaining the nature (type, size, location, and orientation) of imperfections that are capable of being detected in the specific application of these examinations is directed to discuss this with the manufacturer of the tubular product. 11.2.3 For ultrasonic testing, the calibration reference notches shall be at the option of the producer, and shall be any one of the three common notch shapes shown in Practice E 213. The depth of notch shall not exceed 12.5 % of the specified wall thickness of the pipe or 0.004 in. [0.1 mm], whichever is greater. 11.2.4 For eddy current testing, the calibration pipe shall contain, at the option of the producer, any one of the following calibration standards to establish a minimum sensitivity level for rejection. 11.2.4.2 Transverse Tangential Notch—Using a round tool or file with a 1⁄4 in. [6 mm] diameter, a notch shall be filed or milled tangential to the surface and transverse to the longitudinal axis of the pipe. The notch shall have a depth not exceeding 12.5 % of the specified wall thickness of the pipe or 0.012 in. [0.3 mm], whichever is greater. 11.2.4.3 Longitudinal Notch—A notch 0.031 in. [0.8 mm] or less in width shall be machined in a radial plane parallel to the tube axis on the outside surface of the pipe, to have a depth not exceeding 12.5 % of the specified wall thickness of the tube or 0.012 in. [0.3 mm], whichever is greater. The length of the notch shall be compatible with the testing method. 11.2.4.4 Compatibility—The discontinuity in the calibration pipe shall be compatible with the testing equipment and the method being used. 11.2.5 For flux leakage testing, the longitudinal calibration reference notches shall be straight sided notches machined in a radial plane parallel to the pipe axis. For wall thickness under 0.500 in. [12.7 mm], outside and inside notches shall be used. For wall thickness equal and above 0.500 in. [12.7 mm], only an outside notch shall be used. Notch depth shall not exceed 12.5 % of the specified wall thickness, or 0.012 in. [0.3 mm], whichever is greater. Notch length shall not exceed 1 in. [25 mm], and the width shall not exceed the depth. Outside diameter and inside diameter notches shall be located sufficiently apart to allow separation and identification of the signals. 11.2.6 Pipe containing one or more imperfections that produce a signal equal to or greater than the signal produced by the calibration standard shall be rejected or the area producing the signal shall be rejected. 11.2.6.1 Test signals produced by imperfections that cannot be identified, or produced by cracks or crack-like imperfections, shall result in rejection of the pipe, unless it is repaired and retested. To be accepted, the pipe must pass the same specification test to which it was originally subjected, provided that the remaining wall thickness is not decreased below that permitted by the specification. It shall be permissible to reduce the outside diameter at the point of grinding by the amount so removed. 11.2.6.2 It shall be permissible to evaluate test signals produced by visual imperfections in accordance with provisions of Section 14. A few examples of these imperfections would be straightener marks, cutting chips, scratches, steel die stamps, stop marks, or pipe reducer ripple. 11.2.7 The test methods described in this section are not necessarily capable of inspecting the end portion of pipes. This condition is referred to as end effect. The length of the end effect shall be determined by the manufacturer and, when specified in the purchase order, reported to the purchaser. 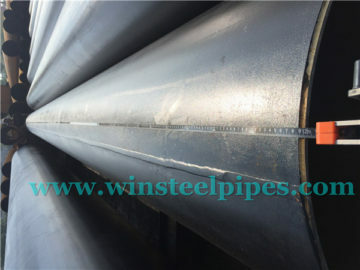 12.1 Weight—The weight of the pipe as specified in Table X2.2 and Table X2.3 or as calculated from the relevant equation in ASME B36.10M shall not vary by more than 610 %. NOTE 7—The weight tolerance is determined from the weights of the customary lifts of pipe as produced for shipment by the mill, divided by the number of feet of pipe in the lift. On pipe sizes over NPS 4 [DN 100], where individual lengths are weighed, the weight tolerance is applicable to the individual length. 12.2 Diameter—For pipe NPS 11⁄2 [DN 40] and under, the outside diameter at any point shall not vary more than 6 1⁄64 in. [0.4 mm] from the standard specified. For pipe NPS 2 [DN 50] and over, the outside diameter shall not vary more than 61 % from the standard specified. 12.3 Thickness—The minimum wall thickness at any point shall be not more than 12.5 % under the nominal wall thickness specified. The minimum wall thickness on inspection shall conform to the requirements in Table X2.4. 13.1 When ordered with plain ends, the pipe shall be furnished to the following practice, unless otherwise specified. 13.1.1 NPS 11⁄2 [DN 40] and Smaller—Unless otherwise specified on the purchase order, end finish shall be at the option of the manufacturer. 13.1.2.1 Pipe of standard or extra strong weights, or in wall thickness less than 0.500 in. [12.7 mm], other than double extra strong pipe, shall be plain-end beveled with ends beveled to an angle of 30°, +5°, −0°, measured from a line drawn perpendicular to the axis of the pipe, and with a root face of 1⁄16 in. 6 1⁄32 in. [1.6 mm 6 0.8 mm]. 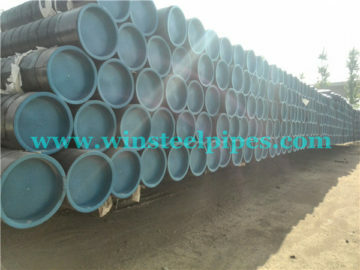 13.1.2.2 Pipe with wall thicknesses over 0.500 in. [12.7 mm], and all double extra strong, shall be plain-end square cut. 13.2 When ordered with threaded ends, the pipe ends shall be provided with a thread in accordance with the gaging practice and tolerances of ANSI B1.20.1. For standard-weight pipe NPS 6 [DN 150] and smaller, refer to Table X3.1 for threading data. For standard-weight pipe NPS 8 [DN 200] and larger and all sizes of extra-strong weight and double extrastrong weight, refer to Table X3.2 for threading data. Threaded pipe NPS 4 [DN 100] and larger shall have thread protectors on the ends not protected by a coupling. 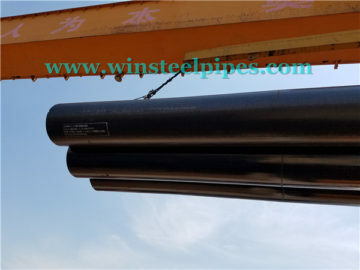 13.3 When ordered with couplings, one end of each length of pipe shall be provided with a coupling manufactured in accordance with Specification A 865. The coupling threads shall be in accordance with the gaging practice of ANSI B1.20.1. The coupling shall be applied handling-tight, unless power-tight is specified on the order. Couplings are to be made of steel. Taper-tapped couplings shall be furnished on all weights of threaded pipe sizes NPS 21⁄2 [DN 65] and larger. For pipe NPS 2 [DN 50] and smaller, it is regular practice to furnish straight-tapped couplings for standard-weight pipe and taper-tapped couplings for extra-strong and double extra-strong pipe. If taper-tapped couplings are required for pipe NPS 2 [DN 50] and smaller on standard-weight pipe, it is recommended that line pipe threads in accordance with API Specification 5L be ordered. The taper-tapped couplings provided on line pipe in these sizes may be used on mill-threaded standardweight pipe of the same size.